The first time I played it, I really hated this game. It reminded me of one of those old-timey pinball machines that didn’t have flippers. You would put in a coin, it would dispense the ball, and your only interaction with the machine would be to pull the plunger. After that, gravity would take over. 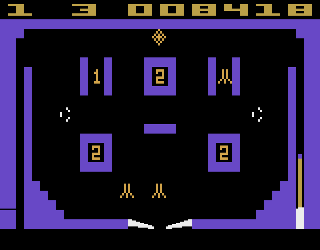 Because of the way that Video Pinball was designed to fit the 4:3 aspect ratio of the home television, the ball doesn’t come in contact with the relatively small flippers very often, making this game seem like a spectator sport. That is, until I realized that you can steer your ball by holding down the fire button while pressing left or right. This is obviously meant to simulate nudging an actual pinball machine. Much like a real machine, if you nudge too much you’ll cause it to tilt and then you lose your game, but nudge it just enough and you can steer clear of danger or pick up some extra points. Through wise use of the nudging feature, it’s possible to keep your ball in play almost indefinitely which makes the game a little bit too easy. The game has three round bumpers (they’re actually square but they deflect the ball as though they were round), two rollovers, and two spinners. There are three diamonds at the top of the screen, and clearing the diamonds will increase the value of the bumpers. Each time the left rollover is traversed, you are awarded 100 points and the counter goes up by 1. Once you lose your ball, you get 1000 points multiplied by whatever number is displayed on that rollover up to 4000 points. Hit the right rollover, which displays an Atari logo, 4 times and you get an extra ball. While it pales in comparison to video pinball games on newer systems, Video Pinball for the 2600 was a respectable pinball game for its time. The table layout is overly simplistic and the graphics are poor, but this was to be expected in the earlier days of the VCS. Buy Video Pinball on GameGavel or Amazon. Tagged 2600, Atari, Bob Smith, Pinball, Review, VCS, Video Pinball. Bookmark the permalink.